Goujian’s Bronze Sword, Made 510 B.C. In 1965, an archaeological survey was being performed along the second main aqueduct of the Zhang River Reservoir in Jingzhou, Hubei, more than fifty ancient tombs of the Chu State were found in Jiangling County. The dig started in the middle of October 1965 and ended in January 1966. More than 2,000 artifacts were recovered from the sites, including a bronze sword. In December 1965, 7 kilometres (4.3 mi) from the ruins of Jinan, an ancient capital of Chu, a casket was discovered at Wangshan site #1. Inside, an ornate bronze sword was found with a human skeleton. On one side of the blade, two columns of text are visible. Eight characters are written in an ancient script which was found to be one known as Bird-worm seal script (literally “birds and worms characters” owing to the intricate decorations of the defining strokes), a variant of seal script. 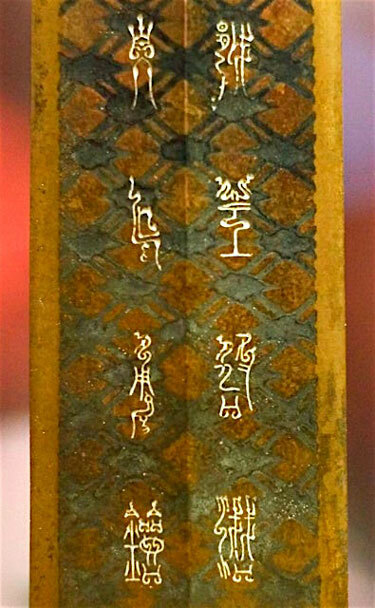 Initial analysis of the text deciphered six of the characters, “King of Yue” and “made this sword for [his] personal use”. The remaining two characters were probably the name of this King of Yue. 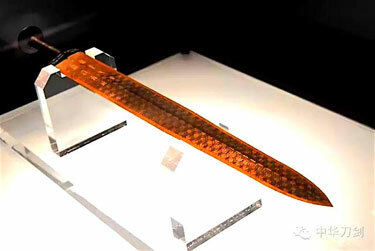 The Sword of Goujian still has a sharp blade and shows no signs of tarnish. … It is likely that the chemical composition, along with the almost air-tight scabbard, led to the exceptional state of preservation. The body of the blade is mainly made of copper, making it more pliant and less likely to shatter; the edges have more tin content, making them harder and capable of retaining a sharper edge; the sulfur decreases the chance of tarnish in the patterns. the Archives of Never Yet Melted in the 'Bronze Sword' Category.